Consider the following in planning your wedding reception during the summer. During the summer, the days are longer with beautiful sunsets and this alone enhances outdoor wedding receptions. Plan your reception to commence between 5-7 p.m. in the evening. Consider renting white canopy’s or tents for your guest to enjoy your reception outside. If it is a little cooler, place a few heat lamps in various locations. Strategically place Chinese hanging lights throughout your tent area to illuminate your reception area and guests as the evening grows darker. Centerpieces – Purchase bright summer flowers to decorate your tables with beautiful centerpieces consisting of white carnations, golden yellow calla lilies, and volkenfrieden delphinium. 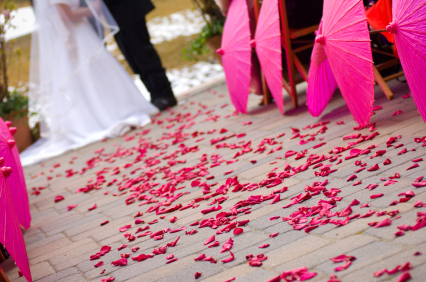 Walkway to Reception Area – Lightly scattering hot pink colored of rose petals along the walkway to your reception area will add an elegant touch as the guests enter to celebrate your marriage. Tent Corners – Purchase super gerbera daisies white with pink and arrange them in all corners of your tent areas. As guests glance at your beautiful bright table centerpieces they will also notice the vibrant colors of the gerbera daisies off in the not too far distance. Wherever you choose to have your reception and no matter what colors your use for decorations, please remember that Fiftyflowers.com offers a wide variety and selection to meet all your needs.